Successfully Added Mobilus - Handheld GPS Navigator and Mobile Phone with Internet to your Shopping Cart. The ultimate in portable communications, handheld GPS navigation, and on-the-go internet surfing is now available with the Mobilus Handheld GPS Navigator and Mobile Phone. Along with providing clear and reliable GPS directions, this all-in-one portable mobile device also allows you to make phone calls, send SMS messages, watch videos, surf the internet, and so much more. Powerful Handheld GPS Navigator: The Mobilus provides clear, reliable, and fast directions to any place you want to go. Take it with you everywhere as a portable GPS navigator, or better yet, use the included mounting hardware and set it up inside your car! Along with tons of powerful GPS navigation functions, the Mobilus is an invaluable tool for the modern traveler and commuter. Mobile Communications and Internet Device: With the built-in speaker and microphone, you can use the Mobilus as a complete mobile communications device. Dial a number directly (or one-click contacts through the phonebook) for quick and easy phone calls. You can even send/receive SMS messages and go online through GPRS to check your email and surf the web - all instantly and directly from the Mobilus! Portable Media Player: High quality digital entertainment now comes in a portable, handheld form. The Mobilus comes complete with a brilliant 5 touchscreen and provides powerful, lag-free playback of all of your favorite video, audio, photo and e-Book files. Enjoy your favorite multimedia at any time, any place. The Mobilus Handheld GPS Navigator comes with a compact and portable design that holds a huge range of functions, fulfilling your every communications, entertainment, and navigational needs. Available in our warehouse now, order today and we'll express ship it out tomorrow. Brought to you by the leader in wholesale electronics - Chinavasion. 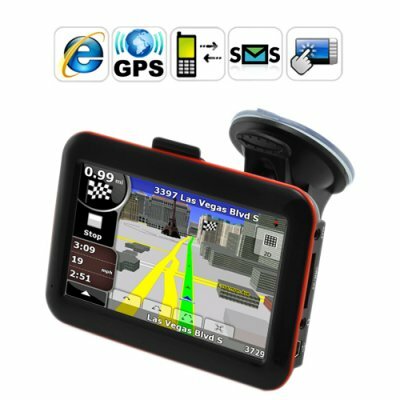 Special GPS Note: This model is compatible with most brands of GPS software, such as TomTom, iGO, Route66 etc. - however hardware specific software such as Garmin may not run on this unit. As the wholesaler, Chinavasion provides the GPS-enabled hardware only and provides no warranty or customer support regarding GPS software. Chinavasion cannot provide downloads / links / advice regarding GPS software. Any software installation you undertake should be performed or supervised by a professional. The Mobilus comes with an evaluation/demo GPS software called: iGO 8. You be the judge! Does the TomTom GO 740 have... Full internet access and browsing? Nope. Make calls directly from the GPS Navigator? Nope. Send SMS messages? Nope. Cheap wholesale price? Nope. The Mobilus has all that, and more! How come when I start Bluetooth it tells me the path is wrong? Unfortunately, the Mobilus does not have Bluetooth. Selecting Bluetooth has no use on this model. Yes, the GPS Navigator comes supplied with a free 4GB SD card that includes demo/evaluation GPS software! Copy the software and maps onto the SD card and insert it into the GPS navigator. From the main menu, go to Menu, Settings, System, GPS Patch, then point to the file that looks like this: nameofGPSsoftwaremaker.exe where the first part of the file before the dot is the name of the software maker, and the part after the dot signifies that it is an executable file. You don't have to pay to use GPS! The satellites which transmit GPS coordinates are maintained by the US government. You just need a GPS receiver to take advantage of the data. The Mobilus Portable GPS Navigator contains a top of the line GPS receiver.